I don't know about you, but I'm not 100% sure about anything. The older I get, the less sure I am about everything. I question things that I was sure were true when I was 25 years old. I'm not sure I'll wake up in the morning. I'm not sure I'll survive my commute to work. That is why I was flabbergasted last night as I watched Scott Pelley interview Ben Bernanke on 60 Minutes. As a side note, boy this show has gone downhill. In the old days of real journalism, Mike Wallace would have scorched Ben Bernanke, pointing out his phenomenal ability to be wrong or clueless on every financial issue the country has faced in the last 10 years. Today, Pelley under hands softball questions to Bernanke and never challenges him. It was a pathetic display of journalism. Pelley: Is keeping inflation in check less of a priority for the Federal Reserve now? Bernanke: No, absolutely not. What we're trying to do is achieve a balance. We've been very, very clear that we will not allow inflation to rise above two percent or less. Pelley: Can you act quickly enough to prevent inflation from getting out of control? Bernanke: We could raise interest rates in 15 minutes if we have to. So, there really is no problem with raising rates, tightening monetary policy, slowing the economy, reducing inflation, at the appropriate time. Now, that time is not now. As you can see, he has been a regular Nostradamus with his predictions. Whenever I see Bernanke or Obama seek to go on 60 Minutes I get the impression they are getting desperate. Last night was nothing but a PR effort by Bernanke because he is losing control of the situation. Our entire financial system is nothing but a confidence game. During the interview, Bernanke made two BIG LIES. He said that buying $600 billion of US Treasuries would reduce long term interest rates. 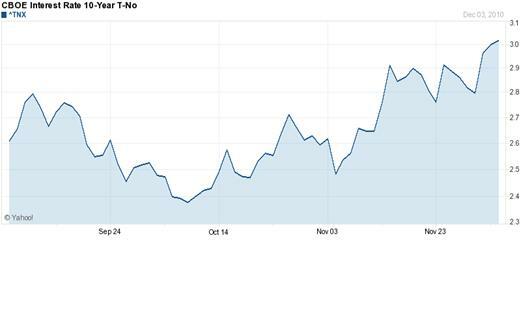 When Bernanke made it clear he would institute QE2 in early October the 10 Year Treasury was at 2.4%. Today, it is 3.0%. Mortgage rates are tied to the 10 year Treasury. They are rising, not falling. Bernanke is lying. His sole purpose for QE2 is to make the stock market go higher, enriching his Wall Street masters. Oil is at $89 a barrel, up 21% in the last year. Gold is trading at $1,413, up 23% in the last year. Silver is trading at $30, up 66% in the last year. Copper is trading at 4 per pound, up 26% in the last year. Corn is trading at 573 a bushel, up 49% in the last year. Soybeans are trading at 1,300 a bushel, up 23% in the last year. Wheat is trading at 779 a bushel, up 41% in the last year. Pork is trading at 104 a pound, up 23% in the last year. Beef is trading at 106 a pound, up 28% in the last year. Cotton is trading at 130 per pound, up 78% in the last year. Sugar is trading at 29 per pound, up 32% in the last year. Coffee is trading at 205 per pound, up 40% in the last year. If you think these figures couldn't possibly be correct, go to this link and verify for yourself. Evidently, Mr. Bernanke thinks that the sheeple will just believe him because he is the Federal Reserve Chairman. The truth is that only two things are deflating: middle class wages and home prices. Bernanke certainly has chutzpah when blatantly lying to the American public about inflation. I'm sure none of you drive cars, heat your homes, eat food, or wear clothes. I'm 100% sure that Ben Bernanke will be wrong again. He will ultimately be known as the professor that never saw the collapse of the USD coming. I am 100% sure that Bernanke is 100% wrong that he can 100% tame a sudden surge in inflation. There, three 100% calls in 15 seconds (not 15minutes). I should be the Fed chair.